100 Lebanese Recipes HD for iPad! 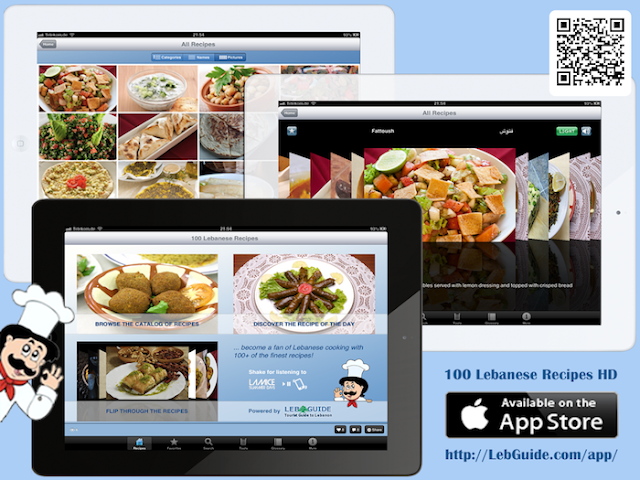 The HD version of the 100 Lebanese Recipes app is now available: "100 Lebanese Recipes HD" for iPad! Download the HD version for iPad! Use this app and bring the delicious taste and richness of the Lebanese cuisine to your home - enjoy the finest Lebanese recipes and experience the flavor of the Middle-East. The huge variety of dishes includes among others traditional salads, starters, meat, chicken, fish and vegetarian dishes as well as famous desserts. It will allow you to prepare typical Lebanese menus and surprise your family and friends. All recipes are decorated with high quality pictures to give you an upfront idea of what you are just about to cook. Recipes collection include Ahweh, Ahweh Baida, Ajeen, Arayes Kafta, Ardichowke bi Lahme, Arnabeet Mekli, Awamat, Ayran, Baklawa, Barazek, Batata bil Kizbara, Bathinjan Mekli, Bathinjan Moutabal, Bazella w Riz, Bemieh bi Zayt, Bouza bi Haleeb, Burghul Banadoura, Daoud Bacha, Falafel, Farrouj Meshwi, Fassolia bi Riz, Fatayer bi Sabanikh, Fattet Bathinjan, Fattet Hommos, Fattoush, Foul Medammas, Halawa, Hindbeh bil Zayt, Hommos, Hommos Balila, Jawaneh, Jellab, Kafta bil Sanieh, Kafta Mekli, Kafta Meshwi, Kashta, Kebbe Akras, Kebbe bi Laban, Kebbe bil Sanieh, Kebbe Nayye, Kellage, Kharuf Mehshi, Khibbiz Arabi, Khyar bi Laban, Knefeh, Koussa Mehshi, Laban Matboukh, Laban Omou, Labneh, Lahm bi Ajeen, Limonada, Loubya bi Zayt, Maakarona bi Laban, Maakroun, Maamoul bi Fistok, Maamoul bi Jowz, Maamoul bi Tamer, Macaroni bil Sanieh, Makhlouta, Malfouf Mehshi, Manakish Jibne, Manakish Zaatar, Meghli, Mjaddara, Moudardara, Mouhalabieh, Mouhamara, Moussaka, Namoura, Nikhaat, Pizza bil Halloumi, Qatr, Riz a Djej, Riz bi Haleeb, Riz bi Shaariyeh, Rkakat Jibne, Sahlab, Salatat Banadoura, Salatat Batata, Salatat Hommos, Salatat Zaatar Akhdar, Samak bi Tahini, Samak Meshwi, Sambousek Jibne, Sambousek Lahme, Samke Harra, Sfiha, Sfouf, Shanklish, Sharab el Tout, Sharab el Wared, Shawarma Djej, Shawarma Lahme, Shish Barak, Shish Kabab, Shish Taouk, Simsmiyeh, Siyadiyeh, Tabbouleh, Tahini, Taratour, Toum, Warak Enab, Yakhnet Batata, Yakhnet Sabanikh. Check out the 105 recipes on http://www.LebGuide.com. Download our app now and become a fan of Lebanese cooking with 105 of the finest recipes! For the latest updates, follow us on Twitter @lebguide.